The Blocfor Self-Retracting lifeline has been designed with safety and ergonomics in mind. 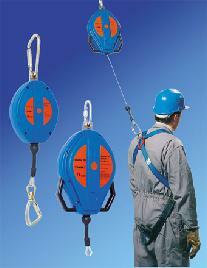 The self-retracting lifeline is easy to handle and lightweight. An innovative designTwin inertia synchronized brake pawls and a constant triggering speed, regardless of position, allow great brake performance.SafeSafety comes first. The Blocfor self-retracting lifeline is built with a fall indicating device on the snap hook connector, a braking mechanism isolated from contaminants and corrosion resistant anti-spark parts.LightweightThe whole Blocfor range is design with special light weight resistant materials. The 20-ft. model weight is less than 10 lbs.ErgonomicThe Blocfor self-retracting lifeline allows hands-free positioning and is very easy to handle. Rubber wire end stop acts as a handle. Models of 50 ft. and over feature a casing with side handles.